Offering captivating views across the city skyline within walking distance of the vibrant Downtown area and Burj Khalifa, the newly opened Renaissance Downtown Hotel, Dubai sits directly on the Dubai Water Canal. It offers an indoor/outdoor swimming pool. The hotel boasts a strong portfolio of chef led dining experiences across 6 F&B outlets with multiple international cuisines and expert mixology. Iron Chef Masaharu Morimoto brings his famed eponymous concept to the U.A.E. with Morimoto Dubai, and David Myers invites you to savor the flavors of a southern French farmhouse at Bleu Blanc by David Myers and full-flavored Italian with BASTA! by David Myers. Guests can enjoy sundowners and shisha at the Middle Eastern style brasserie, BHAR. The coffee shop Grounded serves coffee from local roasters Seven Fortunes and light bites from the hotel’s pastry chefs. Six Senses Spa Dubai is located on the fifth floor of the hotel, offering 6 private treatments suites, one for each sense and a hammam suite. For the health conscious, there is a fitness centre with cardio equipment, free weights and a sauna. After a refreshing workout or the relaxing treatment head over to the vitamin bar for juice or a smoothie. Dubai International Airport is a 20 minutes’ drive from Renaissance Downtown Hotel, Dubai, while Dubai International Financial Centre can be reached in 7 minutes. Dubai Mall and Burj Khalifa is a 10 minutes’ walk from the property, while the rest of Dubai can be reached through the Metro with the Dubai Metro Red Line being a 20 minutes’ walk. With floor-to-ceiling windows, overlooking the Dubai Water Canal, this spacious air conditioned room offers a king bed among chic design with a contemporary Arabic twist. It offers a seating area with a 48 inch flat screen TV, in-room safe, and work desk. There is a mini bar, coffee/tea making facilities and complimentary bottled water. The bathroom has an over-sized freestanding tub and a separate shower . For guests convenience there is a hair dryer, robe, slippers and complimentary Amouage amenities. With floor-to-ceiling windows, overlooking the Dubai Water Canal, this spacious air conditioned room offers two double beds among chic design with a contemporary Arabic twist. It offers a seating area with a 48 inch flat screen TV, in-room safe, and work desk. There is a mini bar, coffee/tea making facilities and complimentary bottled water. The bathroom has an over-sized freestanding tub and a separate shower . For guests convenience there is a hair dryer, robe, slippers and complimentary Amouage amenities. With floor-to-ceiling windows, that showcase the Burj Khalifa, this spacious air conditioned room offers a king bed among chic design with a contemporary Arabic twist. It offers a seating area with a 48 inch flat screen TV, in-room safe, and work desk. There is a mini bar, coffee/tea making facilities and complimentary bottled water. The bathroom has an over-sized freestanding tub and a separate shower . For guests convenience there is a hair dryer, robe, slippers and complimentary Amouage amenities. This room offers access to the club lounge which includes: Open: Sun-Sat, Open: 6:00 am to Midnight -Private access floor -Complimentary food: - Hot buffet breakfast - afternoon tea - hors d'oeuvres - dessert - Grab & Go snacks available all day - High-Speed Wi-Fi - Complimentary Cocktails & non-alcoholic beverages - Evening bar service - Enjoy complimentary breakfast from 6:30am-9:30am and complimentary hors d'oeuvres from 5:30-7:30pm. (breakfast is served in the club lounge only) - Business services, for a fee. Business services include meeting room, computers and printers. With floor-to-ceiling windows, overlooking the Burj Khalifa, this spacious air conditioned room offers two double beds among chic design with a contemporary Arabic twist. It offers a seating area with a 48 inch flat screen TV, in-room safe, and work desk. There is a mini bar, coffee/tea making facilities and complimentary bottled water. The bathroom has an over-sized freestanding tub and a separate shower . For guests convenience there is a hair dryer, robe, slippers and complimentary Amouage amenities. This room offers access to the club lounge which includes: Open: Sun-Sat, Open: 6:00 am to Midnight Private access floor Complimentary food: - Hot buffet breakfast - afternoon tea - hors d'oeuvres - dessert - Grab & Go snacks available all day - High-Speed Wi-Fi - Complimentary Cocktails & non-alcoholic beverages - Evening bar service - Enjoy complimentary breakfast from 6:30am-9:30am and complimentary hors d'oeuvres from 5:30-7:30pm. (breakfast is served in the club lounge only) - Business services, for a fee. Business services include meeting room, computers and printers. This suite category features a king bed surrounded by floor-to-ceiling windows that wrap around the entire room, with plenty of space to relax. It offers a seating area with a 48 inch flat screen TV, in room safe, work desk. There is a mini bar, coffee/tea making facilities and complimentary bottled water. The bathroom has an over-sized freestanding tub and a separate shower . For guests convenience there is a hair dryer, robe, slippers and complimentary Amouage amenities. This room offers access to the club lounge which includes: Open: Sun-Sat, Open: 6:00 am to Midnight Private access floor Complimentary food: - Hot buffet breakfast - afternoon tea - hors d'oeuvres - dessert - Grab & Go snacks available all day - High-Speed Wi-Fi - Complimentary Cocktails & non-alcoholic beverages - Evening bar service - Enjoy complimentary breakfast from 6:30am-9:30am and complimentary hors d'oeuvres from 5:30-7:30pm. (breakfast is served in the club lounge and in Bhar restaurant) - Business services, for a fee. Business services include meeting room, computers and printers. The Executive Suite features separate living and sleeping rooms with floor-to-ceiling windows, overlooking the Dubai Water Canal, this spacious air conditioned suite offers chic design with a contemporary Arabic twist. The bedroom offers a seating area with a 48 inch flat screen TV, in-room safe, work desk with both water and city views. There is a mini bar, coffee/tea making facilities and complimentary bottled water. The bathroom has an over-sized freestanding tub and a separate shower. For guests convenience there is a hair dryer, robe, slippers and complimentary Amouage amenities. This room offers access to the club lounge which includes: Open: Sun-Sat, Open: 6:00 am to Midnight Private access floor Complimentary food: - Hot buffet breakfast - afternoon tea - hors d'oeuvres - dessert - Grab & Go snacks available all day - High-Speed Wi-Fi - Complimentary Cocktails & non-alcoholic beverages - Evening bar service - Enjoy complimentary breakfast from 6:30am-9:30am and complimentary hors d'oeuvres from 5:30-7:30pm. (breakfast is served in the club lounge and in Bhar restaurant) - Business services, for a fee. Business services include meeting room, computers and printers. This spacious suite offers floor-to-ceiling windows with sweeping views of the Burj Khalifa and Dubai city skyline. The chic, contemporary design also features a 48 inch flat screen TV, in-room safe, and work desk. There is a mini bar, coffee/Tea making facilities and complimentary bottled water. The bedroom offers a plush King sized bed, while the bathroom has an over-sized freestanding tub and a separate shower. 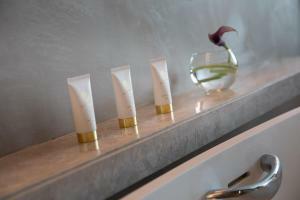 For guests convenience there is a hair dryer, robe, slippers and complimentary Amouage amenities. This room offers access to the club lounge which includes: Open: Sun-Sat, Open: 6:00 am to Midnight Private access floor Complimentary food: - Hot buffet breakfast - afternoon tea - hors d'oeuvres - dessert - Grab & Go snacks available all day - High-Speed Wi-Fi - Complimentary Cocktails & non-alcoholic beverages - Evening bar service - Enjoy complimentary breakfast from 6:30am-9:30am and complimentary hors d'oeuvres from 5:30-7:30pm. (breakfast is served in the club lounge and in Bhar restaurant) - Business services, for a fee. Business services include meeting room, computers and printers. The Vice Presidential Suite is a stunning two room suite, offers a spacious living area, luxurious bedroom, 1.5 baths, and a walk-in closet along with a private service entrance and wet bar. This indulgent suite is complete with amenities including two flat screen TVs, an in-room safe, and work desk as well as a mini bar, coffee/tea making facilities and complimentary bottled water. Guests can feel at ease with a soak in the oversized tub, or take a rinse in the tiled shower featuring dual rain heads. For guests convenience there is a hair dryer, robe, slippers and complimentary Amouage amenities. This room offers access to the club lounge which includes: Open: Sun-Sat, Open: 6:00 am to Midnight Private access floor Complimentary food: - Hot buffet breakfast - afternoon tea - hors d'oeuvres - dessert - Grab & Go snacks available all day - High-Speed Wi-Fi - Complimentary Cocktails & non-alcoholic beverages - Evening bar service - Enjoy complimentary breakfast from 6:30am-9:30am and complimentary hors d'oeuvres from 5:30-7:30pm. (breakfast is served in the club lounge only) - Business services, for a fee. Business services include meeting room, computers and printers.